This work explores what it means to be modern and what it means to be Korean in a culture where courtship and marriage are often the crucible in which notions of gender and class are cast and recast. 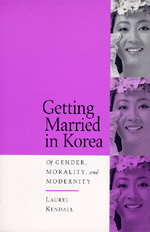 Touching on a number of important issues—identity, romantic love, women’s work, marriage negotiations, and wedding ceremonies—Laurel Kendall gives us a new appreciation for how Koreans have adapted this pivotal social practice to the astounding changes of the past century. Kendall attended her first Korean wedding in 1970, soon after she arrived in the country with the Peace Corps. Years later, as a seasoned anthropologist, she began interviewing both working-class and middle-class couples, matchmakers, purveyors of dowry goods, and proprietors of wedding halls. She consulted etiquette handbooks and women’s magazines and analyzed cartoons, photographs, and weddings themselves. The result is an engaging account of how marriage matches are made, how families proceed through the rites, how they finance ceremonies and elaborate exchanges of ritual goods, and how these practices are integral to the construction of adult identities and notions of ideal women and men. The book is also a reflection on what it means to write “Korea” in a complex and ever changing social milieu. Laurel Kendall is Curator of Asian Ethnographic Collections at the American Museum of Natural History. Her previous books include Shamans, Housewives, and Other Restless Spirits: Women in Korean Ritual Life (1985) and The Life and Hard Times of a Korean Shaman: Of Tales and the Telling of Tales (1988).